​The Yodelling Pickle will bring loads of entertainment and laughs to the office. There are so many uses for this unique pickle; use it to start off the day, as a tension breaker, to get your co-worker's attention, to wake up the office, as a stress reliever, or for yodelling practice! Other inanimate food objects will fall short of greatness in the presence of the Yodelling Pickle. With a push of the button, the pickle yodels its little heart out. 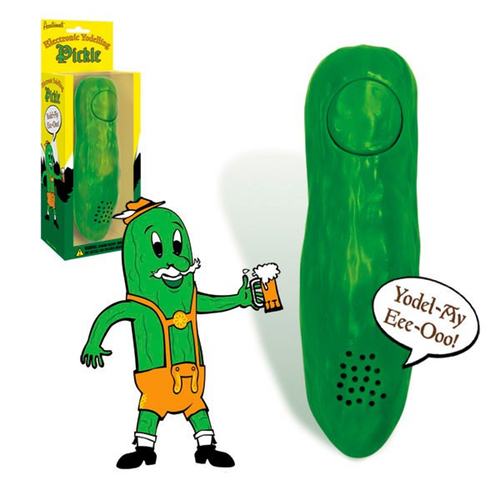 Your co-workers will be jealous when you have the Yodelling Pickle because it is one of the best office toys ever! You don't know what true art really is until you've heard this pickle yodel.